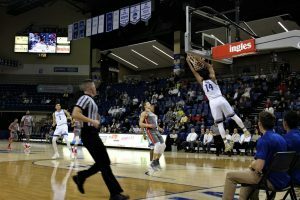 UNC Asheville men’s basketball team beat the Gardner-Webb Runnin’ Bulldogs 65-60 Wednesday night to win the Battle of the Bulldogs. The win improves UNCA’s conference record to 6-3 and moved the Bulldogs up to second in the Big South Conference standings, tied with Campbell and Winthrop. The Bulldogs remain undefeated at Kimmel Arena this season, winning 18 games in a row at home dating back to last season. This impressive home record is huge in such a competitive conference which now has three teams with 6-3 records and two teams with 5-4 records. “It’s tough, it really is, night in and night out anybody can beat anybody. You have to be ready to play whether you’re home or away, whether you’re playing a team that you’re tied with for second or a team that’s in last place, anybody can beat anybody,” said Nick McDevitt, head coach. Wednesday’s game exemplified the competitive nature of the Big South this season. 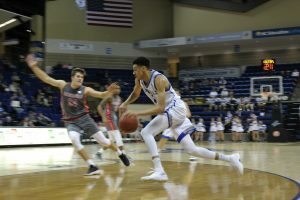 Both UNCA and Gardner-Webb struggled from behind the 3-point line all game, with Asheville making only five of their 23 3-point attempts. Amid the poor shooting display, senior guard Ahmad Thomas kept the Bulldogs alive early, creating matchup problems all night and scoring 12 of the team’s 29 in the first half. Gardner-Webb led 31-29 going into halftime, but UNCA came out of the halftime break looking impressive and composed. With nine minutes left in the second half Raekwon Miller hit a transition 3 to put the Bulldogs up 48-45. UNCA then forced the Runnin’ Bulldogs into a quick turnover which led to a silky no-look pass from Miller to Thomas for an easy bucket that put UNCA ahead 50-45. 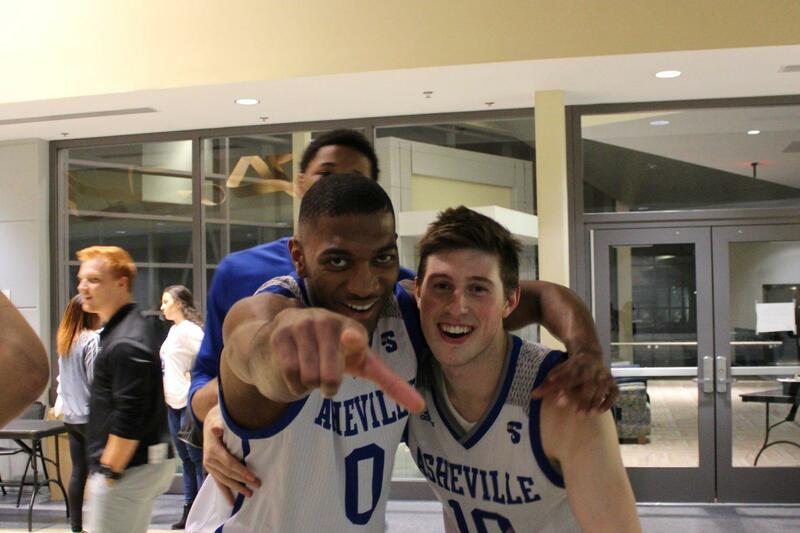 During the next UNCA possession Miller converted a 4-point play to put UNCA up 54-45 and serve as the exclamation point on a great night for the senior. Ahmad Thomas dunks on Gardner-Webb’s Liam O’Reilly. “My teammates found me in some great spots and I was able to knock some shots down,” Miller said. Miller finished the game with 15 points, eight assists and seven rebounds. Thomas added another 13 points in the second half and finished with 25 points, five rebounds and four assists. “I thought it was a really good team win. Especially in the second half, they really came together and pushed through, had the whole crowd going. They were bragging before the game about how well we shot from 3 against Liberty. 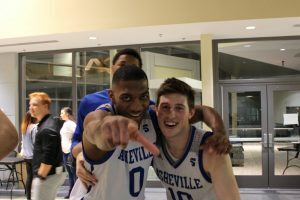 We ended up not shooting well from 3 but still found a way to pull out a win so it was good,” said Jordan Fulbright, a senior at UNCA. Despite big scoring nights for Gardner-Webb’s DJ Laster and David Efianaya, 25 and 18 points respectively, the Runnin’ Bulldogs struggled to find their offensive rhythm due to UNCA’s half court zone. Senior guard Kevin Vannatta did not light up the scoreboard the way he recently became accustomed to, but he played excellent defense, chased down loose balls and finished with seven rebounds and two steals. Sophomore guard MaCio Teague finished with nine points and showed incredible poise sinking four free throws to push the Bulldogs’ lead to 65-60 and ensure the victory. Overall the Bulldogs looked like a well-coached team with the ability to grind out wins even on an off night. “We gave up seven offensive rebounds in the first half, to only give up two in the second half showed we really started battling in the second half. I really liked what I saw from our guys tonight,” McDevitt said in the postgame interview. Donavan Gilmore and Kevin Vannatta celebrate a win after the game. The Bulldogs were lights out from behind the 3-point line at Liberty, but struggled against Gardner-Webb, making only five of their 23 attempts. The Bulldogs will be in action again this Thursday, Feb. 1, when they travel to Buies Creek to face the Campbell Fighting Camels.